This is not a book review. However, there will be a review of this particular book in the next set of ten reviews we add to our website, bringing our total to 190 book reviews. I guess this is a perfect example of not closing the knowing-doing gap. Most everyone has heard the dangers of making assumptions, and yet most of us do it from time to time. My most recent experience occurred at the Atlanta airport on my way to southern Florida to do a keynote presentation. Due to weather conditions, I had an extended layover, and the Atlanta airport (Hartsford Jackson International) has a number of great book stores. Therefore, I invested a good deal of that layover time browsing the aisles in search of new titles. As so often happens, an attractive book cover caught my eye. It quickly met many of the requirements necessary to demand my attention—catchy title, great graphics, and definitive subtitle. Containing only 194 pages and focusing on leadership lessons from a toy box, well, I couldn’t help but make the obvious assumption that this was one of your typical small book rip offs which so often appear trying to cash in on the trend established by financial winners such as Who Moved My Cheese, Fish, and The One Minute Manager. However, having more than enough time between planes, I ventured on between the covers of this unusual approach to leadership. And I’m certainly glad I did. I was instantly reminded that I should never make assumptions OR, if and when I do make an assumption, I should keep an open mind until I have all the information I need to make an intelligent decision while maintaining flexibility in my thinking as I weigh the pros and cons. That realization alone was well worth the price of the book. I bought it, grabbed a burger, fries and Coke, and got comfortable in the food court as I began an enjoyable and enlightening journey through 194 pages of true revelation. As is my usual routine, I scanned the table of contents and was duly impressed. I found it to be short, to-the-point, revealing content, enticing my curiosity. Ten chapters are listed, each identifying a particular childhood toy known to everyone. The subtitle of each chapter then identified the leadership trait that is so clearly represented by each toy. The toys included Lego Bricks, Slinky Dog, Play-Doh, the Yo-Yo, Mr. Potato Head, the Rubik’s Cube, the Rocking Horse, Little Green Army Men, Lite-Brite, and Weebles. I’ll save the corresponding leadership elements for my future book review, but I’ll promise you this: The profound principles you’ll uncover in this book will have you believing that the two authors, Ron Hunter Jr. and Michael E. Waddell, are indeed Transformers. I was so totally consumed by the content of this book, its lively and effortless flow, and its inclusion of nostalgia as a learning tool that I completed it during that layover and the second leg of my journey. Absorbing the content of this particular book allowed my 737 to land 15 minutes before I did! Think about it. I mentioned earlier that this is NOT a book review. It’s a blatant reminder to me, and I hope to you, that we suffer when we make assumptions. I came very close to missing one of the best books I’ve ever read. This book is a very powerful tool for introducing leadership concepts and principles to our younger generation. However, leaders of every age can benefit greatly by revisiting their childhood to learn the timeless laws of leadership. One last note. Based on reader response, one of the most popular features on our web site is Words of Wisdom, which shares powerful quotes, in 22 various categories, from the world’s greatest leaders. I share this with you because I was amazed to find a collection of very profound quotes in this book. Each quotation was chosen to support one of the ten leadership principles revealed by the authors. Those readers who enjoy a great quote will appreciate this book like a “kid in a candy store.” Those quoted within those 194 pages produce a “Who’s Who” of leadership excellence from a very wide variety of perspectives. Each of the following names shared a few words of wisdom to remind me that I should never assume: Admiral Rickover, Albert Einstein, Bobby Knight, Colonel Sanders, Colin Powell, Dale Carnegie, David Gergen, Denzel Washington, Dr. Wayne Dyer, Gandhi, General George Patton, George Bernard Shaw, Prime Minister Benhamin Disraeli, Prime Minister Golda Meir, Henry David Thoreau, Henry Ford, Herb Kelleher, Howard Schultz, Joe Frazier, John Maxwell, Ken Blanchard, Kouzes & Posner, Lee Iacocca, Lao Yzu, Mark Twain, Martin Luther King, Mary Kay Ash, Michael Jordan, Mayor Rudi Giuliani, Mozart, Nelson Mandela, President Abraham Lincoln, President Dwight D. Eisenhower, President Franklin D. Roosevelt, President John F. Kennedy, President Millard Fillmore, President Richard Nixon, President Ronald Reagan, President Zachary Taylor, Ralph Waldo Emerson, Roy Acuff, Spencer Johnson, Stephen Covey, Stephen Hawking, Steve Jobs, Thomas Edison, Tiger Woods, Tommy Lasorda, Tom Peters, Tony Robbins, Walt Disney, Walter Payton, and Winston Churchill. Pretty good company. Great content. I almost missed it all. This experience opened my eyes to future possibilities. Thanks for your kind words for Toy Box Leadership. I’m glad you didn’t miss the lessons of this powerful little book. 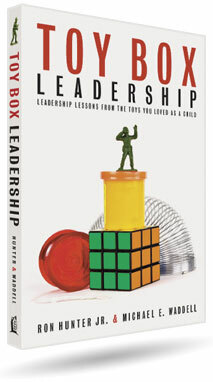 co-author of Toy Box Leadership: Leadership Lessons From The Toys Yo Loved As A Child.